FanDuel has announced their 2019 World Fantasy Baseball Championship (WFBC) which includes a total guaranteed prize pool of $2 Million! The first place champion wins $500,000! All 125 finalists will cash out! The FanDuel live championship will be held on Saturday, August 24, 2019 in San Diego, CA. Each finalist will receive a VIP package ($4,000 value) including a three night trip for two people, and a $1,000 credit for round-trip airfare. Each finalist also receives one contest entry and one for their guest into the $50K MLB Single Game Championship (SGC), entry for two people to the FanDuel SGC live viewing party at Petco Park on Friday, August 23, 2019, entry for two people to the Sunburn Pool Party at the Hard Rock Hotel on Saturday, August 24, 2019, and entry for two people to the WFBC live final viewing party! The FanDuel WFBC is a qualifier event only. Multiple qualifier and super qualifier contests will be offered at various entry fees every MLB week beginning on April 1, through August 9, 2019. You may qualify up to a maximum of six times for this championship tournament. 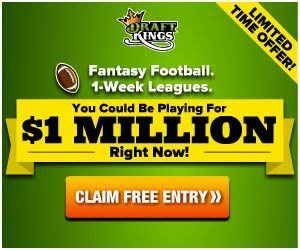 Fantasy baseballers, draft your lineups for a shot at the guaranteed $2 million prize pool, and a chance to become a fantasy baseball legend!